Jenkins Group recently announced the winners of the tenth annual Axiom Business Book Awards, honoring the best business books published during the past year. The medal-winning books epitomize the Axiom Award motto, “Success through Knowledge,” by offering the latest information to help business people succeed in a fast-changing world. The medalists in this prestigious and competitive contest will serve as the premier list of new and innovative works. 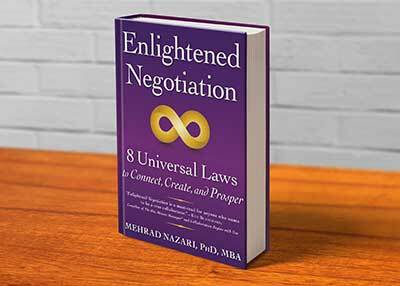 In the Business Ethics category, the bronze Award goes to Dr. Mehrad Nazari’s book Enlightened Negotiation: 8 Universal Laws to Connect, Create, and Prosper. Dr. Mehrad Nazari, is passionate to share the essence of Enlightened Negotiation® with conscious leaders and entrepreneurs. His diverse and unique background makes him most qualified to present this integrated approach. Three decades as an award-winning business leader, two decades as an acclaimed professor of business negotiation, and two decades of being a recognized luminary in the field of human potential through yoga and meditation. Dr. Nazari earned his MBA and was awarded his PhD in Leadership and Human Behavior. As a presenter on negotiation and spirituality, Dr. Nazari regularly runs workshops and lectures at Fortune 100 companies such as Sony, eBay and Brookfield. As a keynote and speaker, he has presented at the Social Venture Network conference, the Green Spa Network Congress and IDEA Health and Fitness convention. He is on the faculty at the renowned Esalen Institute in Big Sur, California and the legendary wellness resort, Rancho La Puerta in Mexico. He has lectured at UC Berkeley, the Presidio Graduate School in San Francisco, the University of California, San Diego, the Alliant International University in San Diego, National Conflict Resolution and the San Diego County Bar Association. Dr. Nazari says of receiving the award, “It is truly an honor to be recognized by the Axiom Business Book Awards, as they are designed to celebrate excellence in business book writing. Axiom recognizes the innovative, intelligent, and creative aspects of new business books that make us think, see, and work differently every day.” Business people are always looking for new ideas and solutions to their problems, and Enlightened Negotiation fills this niche with its informative and innovative approach to finding solutions.